Getting the right hue using the Pantone® Color Matching System. We’re fresh off a project for New Glory Craft Brewery, a Sacramento-based brewery founded in 2012. 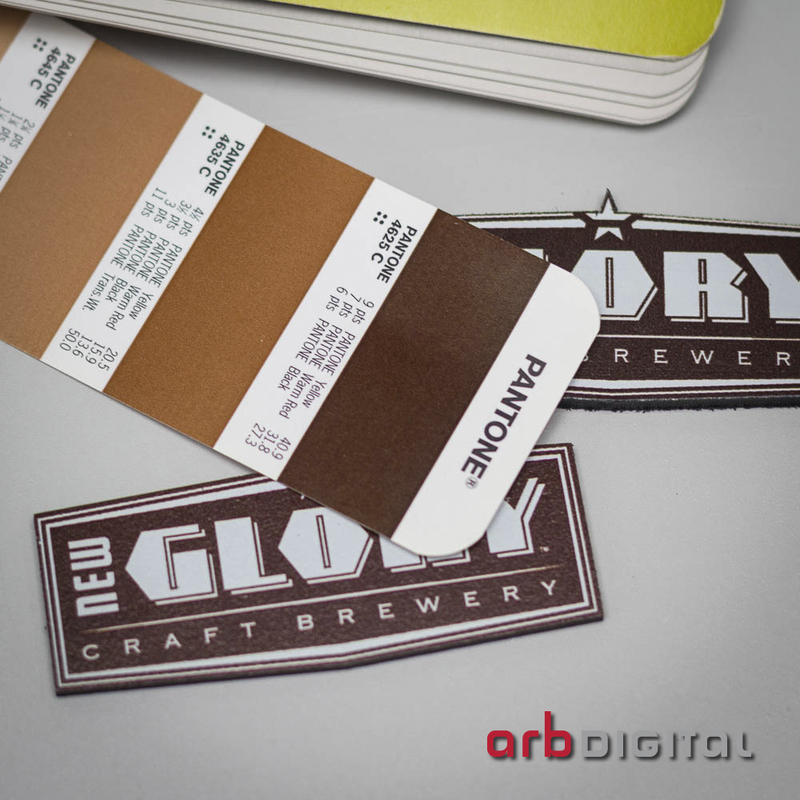 They’ve been growing steadily since their establishment and when they decided to make new tap handles for their onsite taproom, they came to ARB Digital to create customized tags bearing the New Glory brand. If you’re familiar with the beer selection behind a bar, you may already know that tap handles can be quite distinctive. We learned that the design of a good tap handle is almost as important as the beer itself, as it may encourage or discourage a patron to try the brew. Craft breweries are using their handles as a way to, as a Men’s Journal article puts it, “accentuate their ethos.” Great tap handles can enhance a patron's overall experience, helping a brewery stand out from its competition. We began creating New Glory’s tags with a solid sheet of black plastic. With the design of the deep brown and white New Glory brand on file, we first printed a layer of white ink onto the media, which provided a base for the brown to be printed with a higher white point. We then used the Pantone® Color Matching System to match the exact brown hue, which we achieved after only a couple of attempts! Once the print was complete, we cut the tags with a large scale router. New Glory is currently in the process of creating the handles on which the tags will be attached, and we look forward to sharing the final product when it’s complete. Maybe we’ll celebrate with a glass of their Sactown Ale!